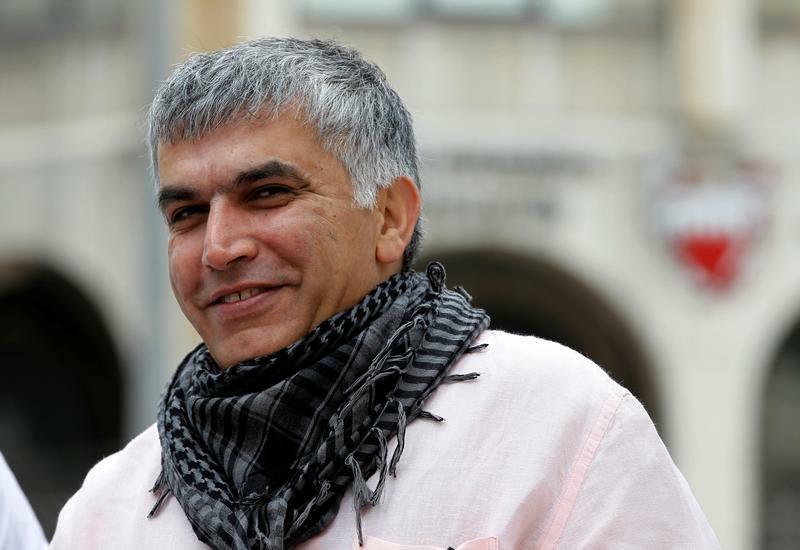 (Beirut) – A prominent Bahraini human rights activist, Nabeel Rajab, is suffering from health problems that have developed or deteriorated during more than 10 months of arbitrary detention, Human Rights Watch said today. The charges against him violate his right to free expression, and there is evidence he has been punished arbitrarily. Bahraini authorities arrested Rajab in June 2016, following his social media comments critical of Saudi Arabian airstrikes in Yemenand alleged torture in a Bahrain prison. Since then, his health has deteriorated dramatically. He has undergone two operations, suffered two bouts of heart palpitations that required emergency medical care, and has developed a range of other medical conditions, including a low white blood cell count and depression. Most recently, his family told Human Rights Watch, the authorities returned him to his cell two days after an April 5, 2017 operation, contrary to medical advice, leading to his re-hospitalization on April 8. He is in the Public Security Forces Clinic in Qalaa. Comments on Rajab’s Twitter account about the Saudi-led coalition airstrikes in Yemen led to his initial arrest, on April 2, 2015. Authorities released him more than three months later, on July 13, but prosecutors ordered his re-arrest on June 13, 2016. Bahrain’s penal code provides for up to 10 years in prison for anyone who “deliberately announces in wartime false or malicious news, statements or rumors.” If convicted of “offending a foreign country,” referring to Saudi Arabia, Rajab faces a two-year sentence under article 215 of the penal code. If convicted of “offending national institutions,” based on comments about unrest in Jaw Prison in March 2015, Rajab faces an additional three years under article 216 of the penal code. The thirteenth hearing in that trial is scheduled on May 17. At a December 28 session, a judge ordered Rajab released on bail. But authorities immediately re-arrested him and charged him with making “false or malicious” statements in television interviews in which he criticized the Bahraini authorities’ refusal to allow journalists and rights groups into the country. The third session of this second trial is scheduled for May 3. Rajab faces up to 18 years in jail if found guilty on all charges. The conditions of Rajab’s detention have at times appeared to amount to arbitrary punishment. His family told Human Rights Watch that he has been in solitary confinement since September 4, when the New York Times published an opinion piece he wrote about human rights abuses in Bahrain. On December 20, Le Monde published an article by Rajab. Bahraini authorities interrogated him about both articles and referred both cases to the public prosecution for investigation into alleged violations of article 134 of the penal code relating to alleged “false or malicious information.” In July 2016 he was denied compassionate leave to attend a relative’s funeral. On April 8, Rajab’s family expressed concern that the open wound from surgery to correct a urological/colorectal condition was at risk of infection due to the unhygienic conditions of his cell at East Riffa police station. An April 8 statement by the Bahrain Embassy in the United Kingdomsaid that he had been transferred him to the Public Security Forces Clinic in Qalaa that evening. The charges against Rajab are a clear violation of his right to free expression, protected under article 19 of the International Covenant on Civil and Political Rights (ICCPR), which Bahrain has ratified. The United Nations Standard Minimum Rules for Non-Custodial Measures state that “pre-trial detention shall be used as a means of last resort in criminal proceedings, with due regard for the investigation of the alleged offence and for the protection of society and the victim.” The repeated adjournments of his trial sessions also violate Bahrain’s ICCPR obligations to try Rajab within a reasonable time. Several times during the Obama administration, the United States called on Bahrain to release Rajab and drop the charges against him. The US also held up the sale of F-16 fighter jets pending unspecified human rights improvements. The Trump administration has signaled that it plans to proceed with the F-16 sale despite the deterioration in human rights conditions in Bahrain. Other key Bahraini allies, notably the United Kingdom, have failed to call for Rajab’s release at any stage of his detention. “The silence on Bahrain’s flagrant disregard for human rights from London, and now from Washington under Trump, is nothing less than shameful,” Stork said.